How do you like this week’s DA? Update: Looks like DA might be back on Fridays in The Age, at least this week. 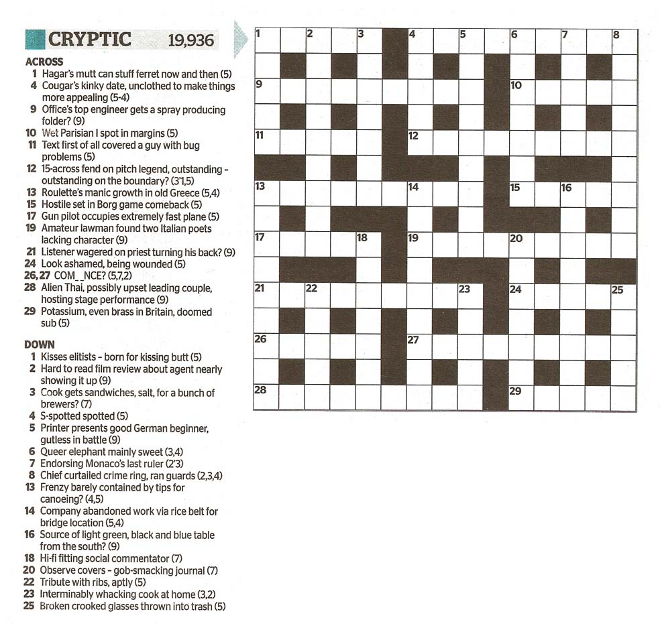 Well, at least I won’t be printing tomorrow’s Guardian Prize crossword across two sheets of paper like I usually do when I forget to switch from portrait to landscape. However, the font size is a concern (I used to be able to do the crossword without my glasses) and there’s a *lot* of whitespace on the page. Hey Rupert, I work for the SMH and we are looking at tweaks that will bump up the font size in coming weeks. Stay tuned. The composition got me. I accidentally filled in the quick grid instead of the cryptic. Just as we’ll the are the same grid! Harder to fold just crossword part to work at while eating. But I’ll adjust. 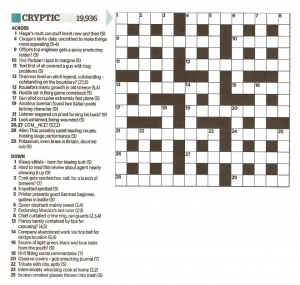 Where is the bloody crossword? It’s a DS on Saturday. Have they switched DA back to Friday? Just checked my Saturday Age—its DS. Arrrgghhh!! I’ll have to check yesterday’s paper and see if it was DA. will report back after 12 when I finish work. Thank you very much for posting the puzzle. I’ll have to buy the Friday paper from now on!